CAPT Thomas Lee Freeland, USN (Ret) passed away on October 12, 2016 at the age 68. He is survived by his wife Jan, his children: Keri (Trevor), Brian (Janina); grandchildren: Reid, Thomas, Ava, Kendall, mother Ann, and brother Larry. He was predeceased by his father Col. Samuel Freeland, USAF (Ret), his daugther Gwen and brother Robert. CAPT Freeland was born on July 26, 1948 in Canton, Ohio to Col. Samuel Freeland, USAF (Ret) and Ann Freeland, age 93. He earned both BS and MA degrees in Mathematics and Statistics. Freeland distinguished 26-year naval career included tours as Officer-in-Charge of an unprecedented nine detachments, earning the first individual Navy “E” for ASW Excellence, and being selected as Pilot of the Year. He capped his flying career as a squadron commanding officer, then as Air Boss on the USS Okinawa during Operation DESERT SHIELD. 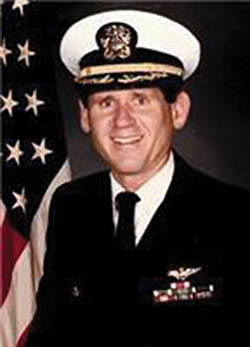 Ashore, CAPT Freeland served with distinction in tours at West Point and on staffs of the Chief of Naval Air Training and of the Chief of Naval Operations at the Pentagon. He retired as the Aviation Program Director at Naval Air Warfare Center, positions while teaching Math at University High School. Tom was an avid golfer, reader, a loving husband, son, father, and doting grandfather.